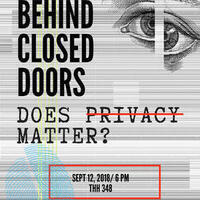 SALON-BEHIND CLOSED DOORS: DOES PRIVACY MATTER? With the emergence of new technologies, our fading privacy has become a controversial topic. When the concept of privacy in the world of technology is discussed, there is an assumption made that privacy is something that we all need, or even deserve. While companies claim that they will keep our data safe, others buy and sell the intimate details of your life. Some people believe that it is necessary to surrender this privacy to our governing entity to keep us and others safe, and perhaps rightly so. But how does the notion of privacy change when every search and site click is used to compile a unique data profile and market goods and services? The more accessible our information the more convient our lives become. How then can we reconcile wanting privacy and desiring convience? Why does Facebook care that I have friends who are expats? How does Instagram know I'm low on shampoo? How can Amazon predict my next purchases? In this first Fall 2018 Salon, we'll discuss what exactly privacy is, whether its deserved or owed to us, and if it matters in the face of immerging and ever changing new technologies.